The DMPOA Community Center is used for Board meetings, other community-related meetings, private functions, package deliveries and a community library (see next item). For those of you who request UPS, FedEx or others to make deliveries for you at the Community Center, there is a designated table located by the ramped handicap-accessible entrance. DMPOA, Inc. does not sign for nor is responsible for any personal, non-DMPOA deliveries. The Center remains unlocked, 24 hours, 7 days a week. If you'd like to hold a community meeting or gathering at the Center, please check with the DMPOA Office Manager to verify the date you want to reserve is open. If the date is available, the DMPOA property owner reserving the facility must fill in an Agreement of Use form and submit it to the DMPOA Office Manager. There are no charges or fees associated with reserved uses of the Community Center. However, if the facility is not cleaned after use or damages have occurred to the property, the individual reserving the facility will be contacted and held responsible. To make reservations for private use, please call the Office Manager, Una Learish, at 432-426-3374. Available in the Community Center and in the library buildings is an eclectic collection of donated and well organized books, videos and audio tapes. Everyone is welcome to browse and borrow from the library via the honor system. If you'd like to make a donation, are interested in helping maintain this free community service, or have any questions about the library please contact Bill Flanders at 432-426-3755. If you have a problem with feral hogs, please click on the file below for more information and how we can help. Hunting of any kind is strictly prohibited in DMR; the restriction is contained in the Covenants (see "Governing Documents"), and it is posted clearly at the cattle guard entrance. Formal complaints should be made to the DMPOA office and information should include proper ID of the suspected offender (name, license plate, location). If you witness out-of-season hunting please contact the Game Warden. Only brush from within DMR is permitted in the DMPOA community Brush Pile, which is located across from the Community Center. State regulations prohibit dumping anything else on the ground, at the Brush Pile or elsewhere; see Illegal Dumping on the "The Trash on Trash" page. The pile is burned under the direction of the county and the DMR VFD Chief. Please be reminded that DMPOA owns materials which are to be taken and used only by Board authorized persons/personnel (including materials on common property). 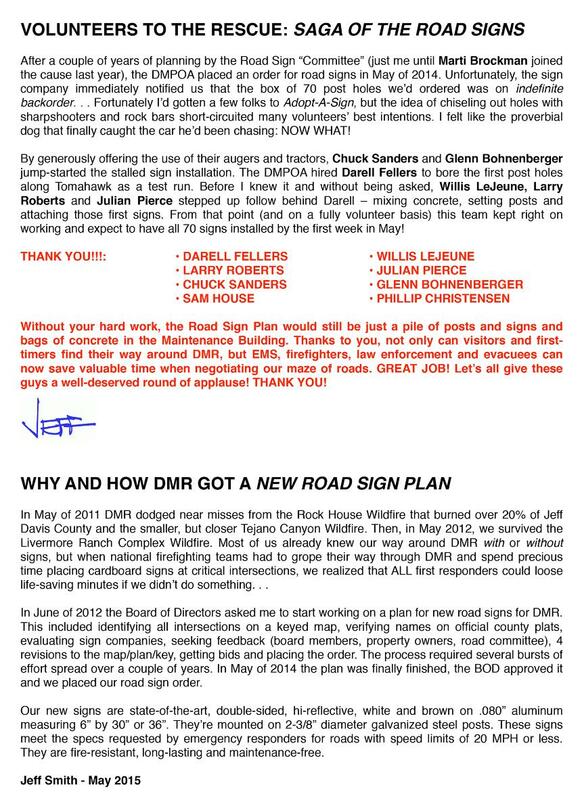 There are several sources for purchasing materials, both in-town and including DMR residents Ron Davis, Joey Brooks, Darell Fellers and Mike Fryer. Yes, DMR has lighting restrictions. 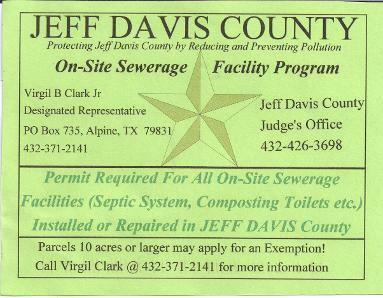 The following document is a copy of Jeff Davis County regulations. Please make special note of the following postcard which was mailed by the county to all licensed installers in July, 2010. There are a number of licensed installers listed in the tri-county phone book (including DMR residents for road materials).